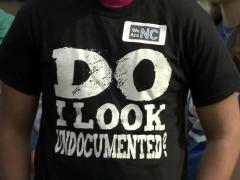 RALEIGH, N.C. — Dozens of people spoke out Wednesday on whether North Carolina should regulate immigration as state lawmakers consider how to clamp down on the flow of illegal immigrants. The House Select Committee on the State's Role in Immigration held a two-hour public hearing on the issue, but committee leaders said further meetings would be put off until the fall as the state awaits a U.S. Supreme Court ruling on the legality of tough immigration restrictions in Arizona. 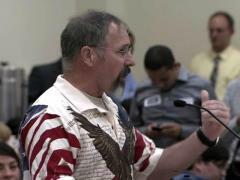 "If you're not here legally, you are stealing from all the rest of us," Cindy Caribou told lawmakers. "We cannot just open everything to everybody in the world." Several ministers said Christianity calls for people to help the downtrodden, including foreigners, and immigrant advocates said punishing illegal immigrants creates more problems than it solves. Patricia Adams of the group We Are North Carolina said immigrant workers, many of whom are undocumented, are a critical component of North Carolina's agricultural industry. "We want our state to actually be inclusive, honorable and just, not just seem that way," Adams said. "Legislators should stop dividing our communities and instead work for policies that unite us and make us stronger." The Pew Hispanic Center estimates North Carolina ranks ninth in population among the states with what it calls 325,000 unauthorized immigrants, defined as foreign-born citizens of other countries who aren't legal immigrants. The Republican-controlled state House is considering measures similar to laws enacted in Alabama and Arizona that restrict access to public services by undocumented workers and empower local law enforcement officers to identify those in the country illegally. Federal authorities who enforce immigration laws have generally discouraged such state-based initiatives. William Gheen, president of the Americans for Legal Immigration Political Action Committee, expressed frustration with lawmakers, saying they have ignored addressing the immigration issue for years. "Stop being cowardly. Get on board with the brave heroes down in Arizona," Gheen said. "If we go through another year without significant immigration enforcement laws in North Carolina, the public out there threw the Democrats out of power after 133 years, and one of the biggest issues on their minds was illegal immigration. "If we've got to throw out Sen. (Phil) Berger as president (pro tem) of the Senate and Thom Tillis down as the speaker of the House, let's do it," he said. The North Carolina Farm Bureau is urging lawmakers to take a measured approach to the immigration issue, running ads that show the damage to the agriculture industry in states that have adopted strict rules. "There's a lot of undocumented labor in agriculture," Henderson County nursery owner Bert Lemkes said after Wednesday's hearing. Lemkes wants an easier process to provide work visas, not a harder one. A tough stance by North Carolina lawmakers would be "an absolute disaster" for the industry, he said. The House committee held two previous meetings on the immigration issue. The last meeting was disrupted near the end by a handful of young Hispanics wearing T-shirts saying "Undocumented and Unafraid." Uriel Alberto, Estephania Mijangos-Lopez and Cynthia Martinez, who are members of the pro-immigrant group N.C. Dream and say they are undocumented, were arrested and charged with disorderly conduct. Committee Co-Chairman Harry Warren warned speakers Wednesday that disruptions wouldn't be tolerated, and he even asked the audience to stop applauding after each speaker finished to maintain order in the hearing. Copyright 2012 by WRAL.com and the Associated Press. All rights reserved. This material may not be published, broadcast, rewritten or redistributed.